RHYTHM OF THE NEEDLES: He's a Keeper! One day my Grandson was at the table with his Mom playing with Play-Doh. She would roll it out and then give it to him. 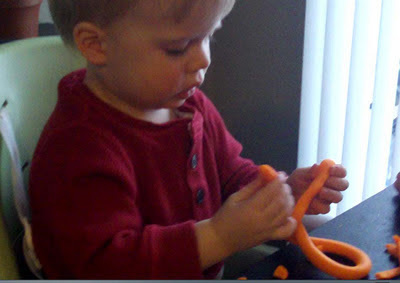 Braydon held onto the two ends and started turning and twisting it. When asked what he was doing he said "knitting". It looks like circular knitting to me. I couldn't be more proud! This picture is a screen shot from a little video. The file was too big to add here. Maybe he'll knit something for his Grandma someday. Cute and clever little boy - well observed Braydon! Only have grand-daughters and none knit yet, though 4-yr-old is looking promising. See, you always knew he was a keeper, and he is! aww doesn't that bless your heart! LOVE. What a great moment.